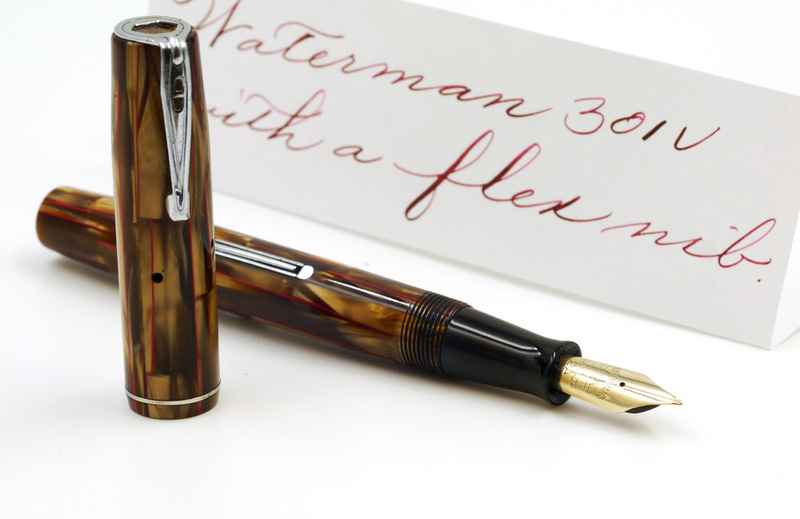 Waterman is famous for its flexible nibs made during the first half of the 20th century. The model 52 is perhaps the most common, performs very well, but it can be pricey. Waterman also made pens that were supposed to be carried in a vest pocked, hence the "V" designation. These were smaller pens when capped, with a really convenient and stylish clip, but converter to full-size pens when posted. Sure, by moderns standards, these are rather slender pens, but they are perfectly comfortable for most people's hands. The 301V is made of gorgeous brown, red-veined celluloid. The material is gleaming, so beautiful, and in absolutely mint condition. The depth and chatoyancy are excellent, and a testament to the quality of vintage celluloid. The star of the show here is, of course, the 14k flexible nib. The nib is in excellent condition, with perfectly preserved geometry, and ample tipping material. It writes a fine line, even and extra-fine line with light pressure, but opens up nicely under pressure. The "snap-back" property is what sets these vintage nibs apart from most modern flex-wannabe nibs made today. I would not call this nib a full-flex, but it is easily a medium flex nib. It would make a perfect first vintage flex nib for a fountain pen enthusiast. Here's my attempt at flex writing, a pretty poor attempt to be sure.